Care-giving and the Art of Mucking. We have a shade tree next to the barn runs that gives the sweetest summer shade, but reeks havoc on winter footing. Colorado temps frequently take 40 degree mood swings in a few hours. Fresh muck can land in wet spring snow, and in a brief moment, freeze so solid that a pick ax is useless. But an hour later, the muck has dissolved, indistinguishable from the mud underneath. Shovel that mess out and you end up trenching small puddles into bigger puddles that will re-freeze into a skating rink in each run. It makes the walk to turn-out a cautious process each morning. An ice fall hurts more than an unplanned dismount at my age, and the younger horses are just as nervous. The Grandfather Horse is the most worried, so as he takes one slow skate of a step at a time. I’m his care-giver; it’s my pleasure to go his speed. There’s plenty of time to wax nostalgic as we dodder our way to turnout. Back when he was a hot-rod 4-year-old, just at this time in the spring, we found him in his turnout pen barely able to stand. His hind-half had lost all coordination, he could barely balance upright. We got him to stagger inside and called the emergency vet. Naturally, I feared a damaged spine or something neurological. The vet’s best guess was that my horse had taken a fall, done the splits behind, and somehow torn his inner thigh muscles. He came away with Bute, 6 weeks of stall rest, and I was ecstatic. I drove out every day and massaged mineral ice on his torn muscles, resting my cheek on his rump next to his tail and watching his eyes go soft, as I braved rude jokes from my barn friends. Embarrassment is part of the care-giver gig. It’s for better or worse, and if you do your utmost and are lucky, you get keep your job as they become old and frail. And in some crazy way, more years of mucking feels like a reward to most of us. 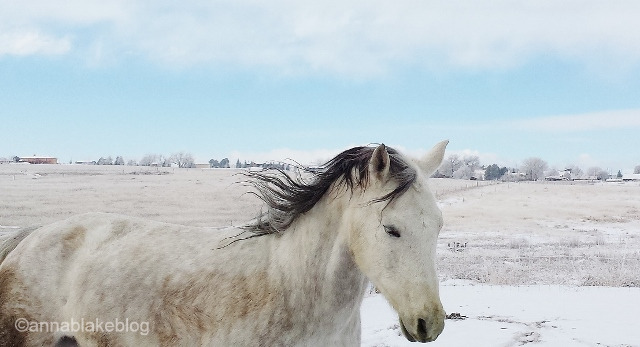 We don’t understand how others can look out the window and feel nothing as winds chill arthritic bones: horses with no shelter or dogs that live on chains. The upside of spring mucking is that it’s also itch season in the barn. So a curry stays in the muck cart and there are some sweet shedding moments with the herd, even if makes the job take twice as long. These slow, hairy hours are the very best. Sometimes I hire-out my mucking but in the end, I always miss it too much. It isn’t that care-givers love manure, but it’s part of the package. Horses understand the law of reciprocity as well as we do, and we strive for integrity with each other. We can’t control the world, but we have a say in our herd. It isn’t truly giving if you keep score, so I’ve lost count of how many times I’ve bandaged their injuries or worn out muck forks poking at manure-cicles or felt such magic dancing beneath my saddle that, when my eyes close, I notice I’m filled with light. I believe that these acts are all interchangeable, and I get back so much more than I give. Sometimes when new people come visit here, the first comment is how much work it must be. I appreciate their honesty. I’m not nuts, I don’t just love frolicking on frozen toes in ground blizzards but I notice that the less I can tell the difference between work and play, the stronger I am. Through good days and bad days, there’s an overall tendency of sweetness. It’s just the simple truth that we all share a very small life here and try to do our best for each other. There is an art to being a care-giver. Not everyone has the patience for it. You have to want to be there fully, grateful for every stride, rewarding every pause for confidence, holding faith in every conscious choice made together. In other words, the care used on the ground with an elder walking on ice, is the exact same care we use in the saddle, with our hands on the reins–every day that we are blessed with these precious, sentient creatures. Amazed at our luck, we take special care, mold it with good intention, and give it back in the purest form we can. So, for as long as there is something that needs mucking, we’ll keep hold of our forks. Because the world is filled with spite and ego and indifference. People do unconscionable things, leaving others to pay for their shortcomings. But we still have a voice. Even if we are no more than the sum of our intent, each time a whiskery muzzle searches for a hand, it’s undeniable that for that life, a small act changed the whole world. Gorgeous post, Anna. Love love love. its been a tough week around my household and your post has warmed my heart and put a knowing smile on my face – thank you! “I notice that the less I can tell the difference between work and play, the stronger I am.” These words really struck me. Great words to live by. Thanks for this comment, nice to know there are like minds out there. With a curry in my pocket yesterday, I was struggling to fork out heavy mud/hay manure and Georgia Peach came up and wrapped her head around me. Muck fork remained stuck in the mud and the curry did it’s job. You hit it on the nailhead Anna! Miles apart, but raising our muck forks in solidarity. Got to love that! I had to share with you that now my friends from all over are forwarding me your blogs! You are getting quite famous. Love your writing! And I still want to get over there and get a lesson, after my shingles goes away. (Get the shot, you do not want this!) I want to learn to softly connect with my pony – softly! No whips, spurs, mouth tied shut, just a soft connection that works for both of us. Dressage on the western slope is pretty disgusting on the whole, but so is most horse sports. It’s the same old thing here, way more fighters than thinkers. So we have to stay loud. We’ll meet one day, and thanks for letting me know that the blog is sneaking it’s way around. Absolutely lovely. I used to work at a barn a few days a week, and those were always the best days. Yes poop DOES heal! But in the spring – having hair everywhere it could possibly (impossibly) get on your body is almost worth going thru the winter! Love your writing and can’t wait to see your book! You must have read my mind. Yesterday I stood with pitchfork in hand, thinking nobody could possibly understand how mucking the paddock every spring is both art and zen. And then today, this … ! Thank you for writing this lovely piece about caregiving. You really get it! Thanks, I bet you get it too. Love it … always enjoy your posts 🙂 shared too!! Thanks for reading… I appreciate it. Surprised anything could make me want to muck again but,…damn if you didn’t manage it. Ah, my work here is done. Good reminder that small acts can change the world. And, muck inspires me too. 🙂 I always say that my stall cleaning time is my meditation time! Like a Zen garden….I have no idea how others who don’t muck gather their thoughts. 🙂 Thanks. Beautifully put. I have three rescued equines, the oldest is now 27, and a rescued greyhound who is now a grand old lady of twelve. All these animals give me so much joy on a daily basis that I could never begrudge any of the jobs associated with having them in my life. Fair trade, right? Good for you, even better from them! Thanks. A hard to read post for my German understanding of English 🙂 But I can relate to what I think you mean. The horses here are turned out during the day and brought in for the night in winter. Sometimes we have to lead them over parts of the street that are fully covered in ice. And we try to find the path that suits them the best and we try to tell them where to put their feet. And they follow as if they knew that we know where they are safe. Lovely creatures. Your understanding is as perfect as a horse. Wonderful comment. What about putting polar melt in those frozen areas, THEN putting sand down? I have even used wood shavings over the top of ice patches (gives the horses AND persons some traction) until the skating rinks are thawed, then I muck out those holes, and put as much sand down as I can. Its really worked well for me. Anna, that is a beautiful piece.Your sentence,” I’m his care giver; it is my pleasure to go his speed” is what all of this is about. Our hearts understand this. Give that big sweet boy a scratch from me…. Our hearts live inside of theirs sometimes, but only if they are generous enough to invite is. It’s your super power.